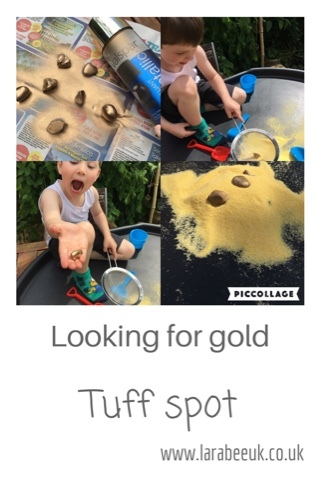 This month we've been looking at the Wild West for inspiration for T's activities, one of the tuff spots I've set up recently is this looking for gold activity. Which T really enjoyed. I only did is small scale and used a bag of polenta instead of sand but you could go all out and use a Tuff spot full of sand for a more full on activity. 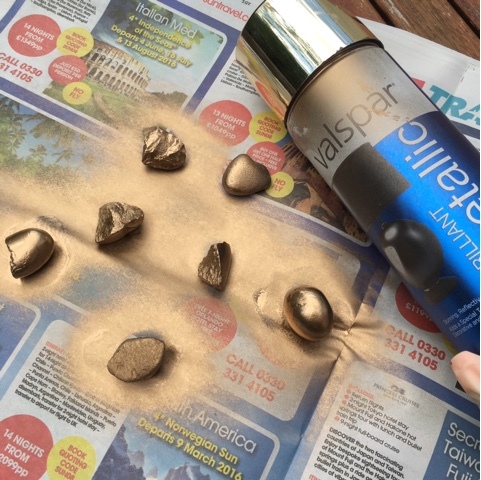 I made some lumps of gold by spray painting some stones from the garden, they turned out really well. I then hid these and a few gems in the 'sand'. 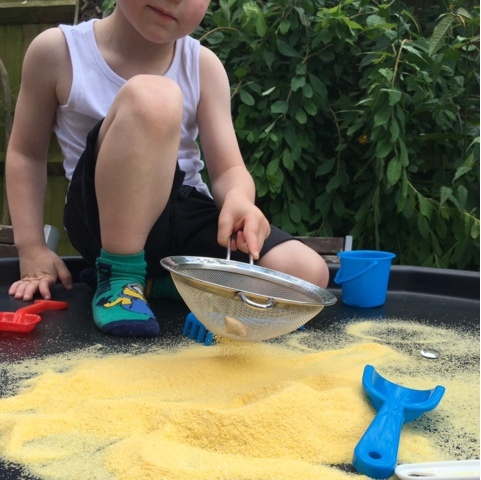 T loves the feel of the polenta through his fingers as it doesn't stick and flows freely. 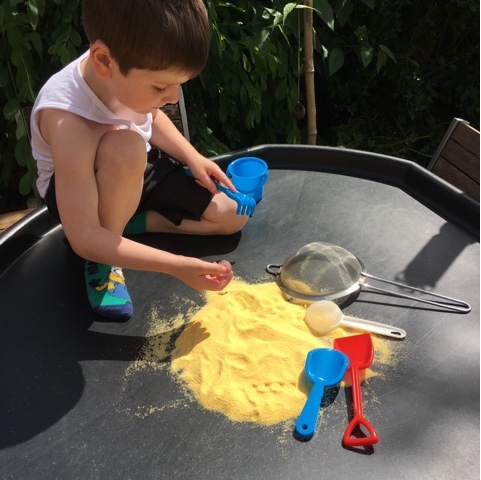 T really struggles with sieving I'm not sure if it's a lefty thing or he just goes to 'get it' but this really helped him practice without getting it everywhere and of course the polenta is much easier than flour or icing sugar so it helps with his fine motor skills and co-ordination. This activity is also great for understanding other countries and history. 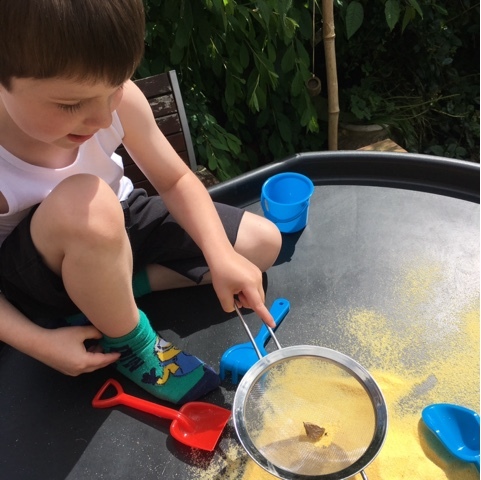 We talked about how difficult it must have been for people working manual jobs like this in the heat and T wanted to hear about Cowboys and what their 'jobs' were, so it really ignited his imagination and got him thinking about the Wild West. 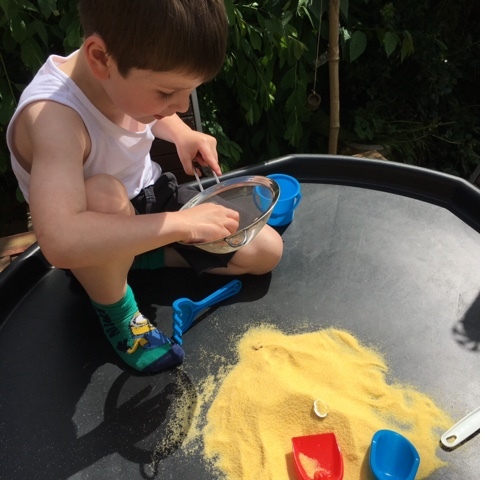 We spent a good hour at this activity, collecting all the gold and then hiding it back in the sand. We really could have done with more polenta, but T did a great job with what he had. This would be a great group activity, perfect for play dates, I'm also thinking about making a game out of it for when T's cousin J comes in the summer as I think this lends itself perfectly. This looks like a really fun activity! 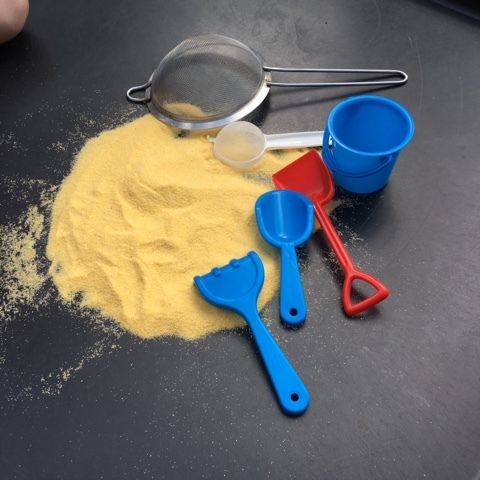 It's great that you can use polenta instead of sand, what a great alternative. This looks like so much fun! 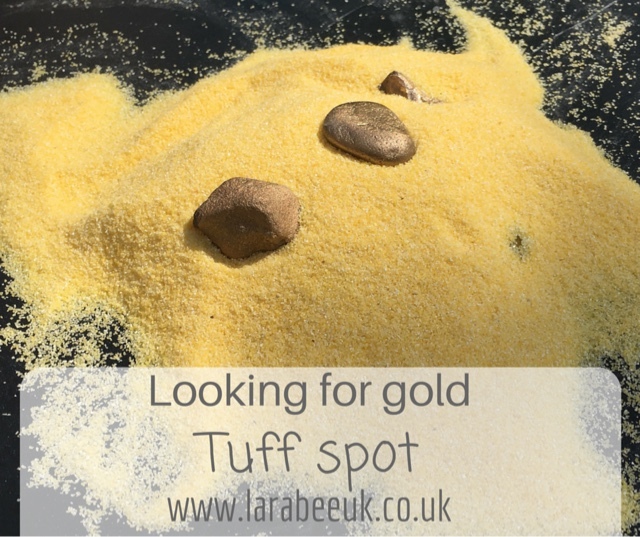 I keep saying to myself I must get my daughter a tuff spot as there are so many awesome things you can do with them This is an idea to add to the list! Yes it looks like a great group activity. We will be trying it. Such a fun idea Leandra, I'm not suprised Thomas had so much fun! 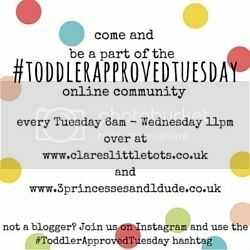 Thanks so much for sharing on #ToddlerApprovedTuesday, hope to see you link up again.